Cannabis use is a polarizing topic in the US. Targeted as dangerous from 1937 onward through propaganda (see Reefer Madness), taxes, and the drug war, cannabis was ultimately classified as a schedule one substance – which means it is among the most dangerous of drugs, and has “no currently accepted medicinal value and a high potential for abuse”. 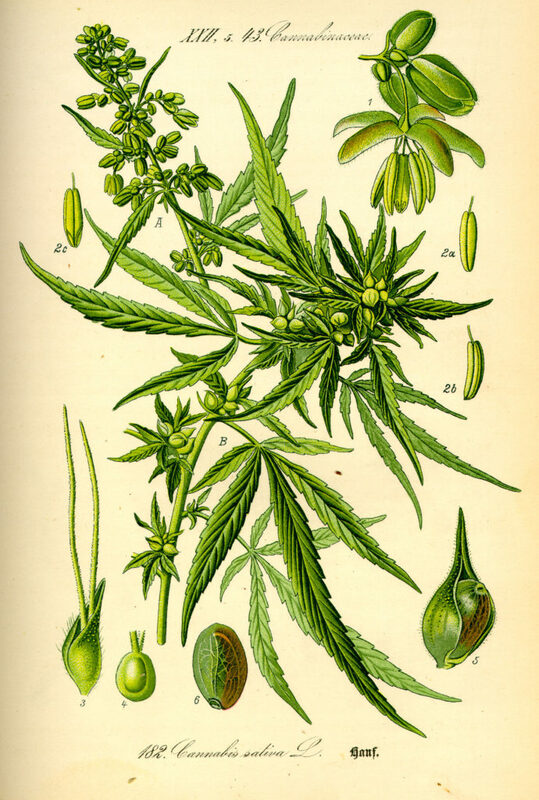 Though cannabis use is associated with negative health effects, such as other substance use disorders, damage to the respiratory tract, and anxiety, for much of recorded human history, this plant has also been used as medicine to treat a wide variety of ailments, including rheumatic pain, constipation, and malaria. Now that 23 states have legalized use of cannabis for several medical conditions, the policy pendulum appears to be swinging back towards therapeutic uses of cannabis. Given the current opioid epidemic – an overdose tragedy that claims thousands of lives annually in the US – and recent research that linked passage of medical cannabis laws to a decrease in opioid overdoses, this may represent an opportunity for a useful therapeutic application of cannabis, as severe and chronic pain is one of the most common qualifying conditions for a medical cannabis license. However, cannabis remains illegal federally, so conducting research that targets therapeutic uses of cannabis is difficult. It is challenging to obtain cannabis for clinical trials, and the schedule one designation means that getting funding to test cannabis’s therapeutic potential is unlikely. Thus, much of the existing literature focuses on cannabis-induced harm. This is reflected in the funding of cannabis-related research. From 2008-2014, 79% of NIH funding for cannabis was devoted to research that was related to abuse and/or focused on negative health effects. These are important downsides to study, as there is significant evidence supporting these claims. However, the research on cannabis as medicine appears equally important, especially in the wake of the opioid epidemic. Is there evidence that cannabis can help combat the opioid epidemic? As mentioned above, states with medical cannabis laws had lower rates of opioid overdose deaths compared to those without. Further, several analyses of the few clinical trials performed using cannabinoids – the active ingredients of cannabis – found that cannabinoids improved chronic pain symptoms. However, such trials are highly regimented, and may not reflect the way that people use cannabis in their daily lives. Indeed, many medical cannabis patients smoke or ingest cannabis rather than taking single cannabinoid compounds. In 2013, I attended a talk about cannabis’s effects on the body. There, I met and started working with the owners of a local medical cannabis dispensary to see whether people who used cannabis actually saw similarly positive effects seen in clinical trials. Collaborating with Dr. Daniel Clauw (a pain specialist at the University of Michigan Medical School), we designed a survey, got approval from the proper ethics authorities, sent it out to patrons of the dispensary, and waited for the data to come in. Reduced their opioid consumption by 64%. Had decreased side effects of their medications (6.5/10 before cannabis, 2.8/10 after, p<0.001) and used fewer classes of medications (2.38 before cannabis, 1.81 after, p<0.001). Had an improved quality of life (increased by 45%). While exciting, our study had a few key limitations. We surveyed patrons of a medical cannabis dispensary; presumably, people who found cannabis to be helpful as medicine. Study participants had also already been using cannabis as medicine before they took the survey, so we don’t know if cannabis was solely responsible for the reported changes, or if other factors (like lifestyle changes, placebo effect, etc.) could have contributed. Further, those responses likely weren’t as accurate as they would be had we known more about the patients before they started using cannabis. But soon after our paper was accepted, I found research from Israel that had seemingly anticipated the weaknesses of our study, and had followed chronic pain patients for 6 months after they started using cannabis. The results of the Israeli study were consistent with ours – chronic pain patients had reduced pain severity, their pain interfered less with their daily lives, and 44% of those on opioids had discontinued their opioid use (the rest had decreased their opioid dose). This complementary study was gratifying, especially in the wake of ongoing problems with opioid over-prescription and overuse. Between these two new studies, analyses showing cannabinoid effectiveness at treating chronic pain, another study that found a state-wide association between the passage of medical cannabis laws and subsequent decrease in opioid overdose, and a report finding that states with medical cannabis dispensaries had decreased opioid addiction and overdose deaths than those without, there is a budding body of evidence suggesting that cannabis could help treat chronic pain AND combat the opioid epidemic. This is tricky, because cannabis is currently in a legal grey area. State policies that allow for more direct contact between healthcare providers, patients, and dispensaries potentially put all those stakeholders at risk from federal law enforcement. (Note: However, the Department of Justice’s Cole memo has de-prioritized medical cannabis patients as targets for federal law-enforcement.) Further, as noted above, comparatively little funding is available for medical cannabis from the federal government. I’m advocating for a sensible approach toward studying cannabis. At this point, claims of cannabis as solely poison seem increasingly illegitimate. By opening up opportunities for empirical study, we could examine cannabis in a less biased manner, rejecting the paradigm of poison and replacing it with more nuanced understanding that can help people in a targeted way.